During the post-war era, America chugged along with a belief that 'bigger is better'. A whole host of consumer goods were following this trend, with cars leading the pack. Engines ballooned into V8 monsters with capacities reaching those of commercial vehicles. Double-digit fuel consumption figures were rarely heard of. Despite this trend, one such motor company of the era saw things differently. Wanting to appease the American people with a true economy car in a market segment that had yet to exist on American shores, the result was the Nash Metropolitan. The Nash company yearned to create a car for those wanting a town car for daily use. Detroit designer William J. Flajole came up with the Nash Experimental International and showcased the design study at New York’s Waldorf Astoria hotel on January 4, 1950. Despite concerns, the preview model was popular, and the decision was made to take the vehicle into production. However, this posed several problems. For a fledgeling company, the cost of tooling and production on home soil proved unviable – in the region of $20 million. The decision was made to find an established manufacturer overseas who could meet the design brief; using parts from existing model lineups. Austin of BMC in the UK was the star choice. Using running gear from the Austin A40 and parts from the Bugeye Sprite, it was the perfect marriage. The famous A-series powerplant was used, which complimented the design as a simple pushrod engine with an excess of 40 horsepower. Although the prototype included a plethora of innovations, only the symmetrical doors made it through to the production model, allowing owners to reduce costs in the event of an accident. Despite the initial mixed reviews, people warmed to the car quite surprisingly. It was a testament to a different engineering perspective, with road testers frequently commenting on the car's agility; considering its tiny engine and dimensions. The car featured here lacks a description, however it offers cues to a growing interest in engine swapped Nash Metropolitans. Although specifics are scant, the tell-tale blower pushing its way out of the hood suggests a potential V8 swap amongst other modifications. With a clear custom paint job to boot, we can imagine what a mentalist this car would be on the road, and how the then optional seat belts would be a must. The deep dish rear wheels and tyres contrasting with the spindly front setup shows that power is a likely ten-fold increase on the originals. Modified front wings to mimic those of the rear complete the look, with a contrasting white interior adds to the aesthetic. We know we’re intrigued to know more, especially what powers this little beast. 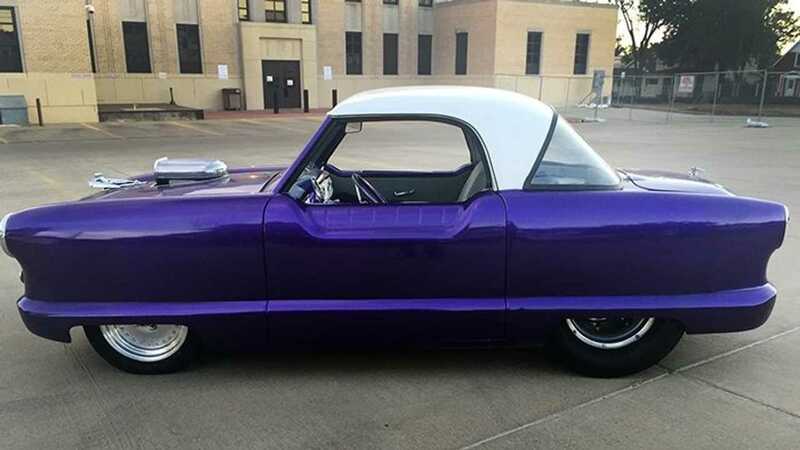 For more information visit the Motorious classifieds, where this Nash Metropolitan is up for auction.